Italian plastics extruder specialist Amut manufactures extrusion lines producing waterproofing membranes capable to process different thermoplastic materials, such as F/PVC, TPO, TPE. The use of these materials improves the technical performances and the physical features of the membrane, complying with international standards and requirements in the civil works sector. The Amut technology allows multi-layers membrane production in one-step (no off-line lamination required) using a single calender properly designed. 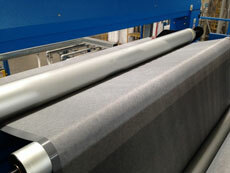 This process reduces the costs and simplifies the running operations for the operator; flexible production guaranteed in terms of different materials processing on the same line; multi-layer reinforced membranes production in one-step by means of reinforcing elements laminated among the layers to enhance the mechanical resistance of the finished product; and support base (fleece-back) lamination, usually on the lower side of the membrane. 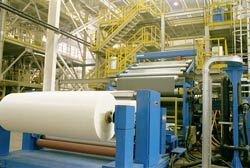 Amut has recently supplied to a large Turkish customer, an HYBRYD type line, capable to produce F/PVC or TPO membrane 2.200 mm width, three layers of thermoplastic material and thickness range from 1 to 3 mm. The extruders’ screws special design is suitable for both materials, so no screw change is required. Within the membrane’s configuration, it is included an inner reinforcing scrim and a bottom protective/supportive fleece (fleece-back). The total output is 1800 kg/h for F/PVC and 1250 kg/h for TPO, giving an annual membrane production of more than 4 million sq m.
A double-inlet calender consents to obtain a “sandwich” geometry in a single step: the external layers, with inserting/laminating of reinforcement in polyester or in glass fibre, and coating of fleece-back. The line is also equipped with thickness gauge measuring device, high accuracy winder unit to produce jumbo and custom rolls and PC/PLC system to control all running operations of the line.